From painting and drawings to the look made famous by movie star Elizabeth Taylor, Cleopatra has become known more for her iconic look than for her political prowess as Egypt's ruler. Whether it’s for Halloween or dress-up fun, help your daughter create a signature Cleopatra look by focusing on dramatic eye makeup, accented by makeup choices for skin, brows, cheeks and lips. Peacock blue eye shadow and a thick line of eyeliner are the most significant features to add for a distinctive Cleopatra makeup look. Apply the blue shadow from the lash line all the way to the eyebrow and add some blue glitter for a more dramatic effect. Eyeliner can be tricky, so make sure to help your child with this part, or simply apply it for her. The line should run from inside the eye to slightly beyond the outside edge, tilting up at the outside corner. Educate your daughter while you help her make up her eyes by informing her that the heavy eye shadow applied by ancient Egyptians decorated the eyes and also protected them from infection and the kohl used to line the eyes protected them from the sun’s harsh glare. Though some historians believe that Cleopatra came from a line of rulers descended from Alexander the Great rather than the more dark-skinned people native to Egypt, Cleopatra is most often depicted with the dark skin color of native Egyptians. Use a bronzer to achieve that look if your daughter is Caucasian or Asian. If her skin color is naturally dark, you might want to create a queenly luster with a reflective moisturizer or body glitter. 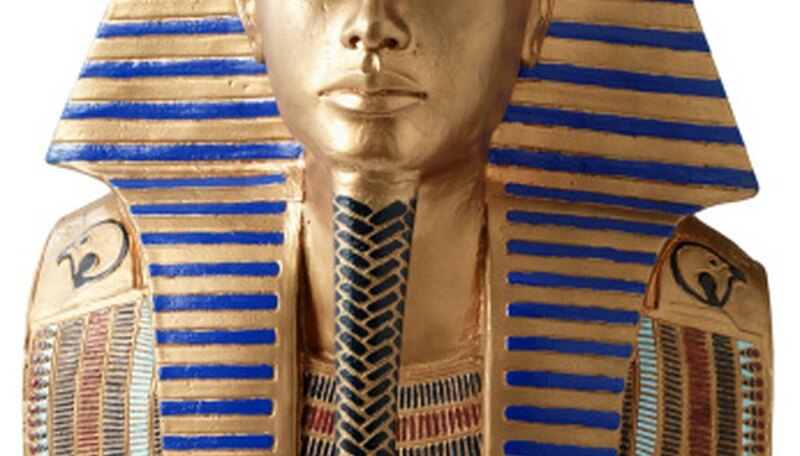 Alternately, consider creating a gold tint to the skin to simulate the gold skin given the pharaohs on their gilded sarcophagi. Don't forget to darken the eyebrows with a black pencil and highlight high cheekbones with blush. Though painting the lips may not have been the primary makeup step for Cleopatra, it's a traditional part of makeup today. Use a deep red lipstick to paint your daughter’s lips if she really wants to go for a glamour-puss Cleopatra look. If your daughter is more interested in a subdued look, opt to color the lips the same as the rest of the skin on her face, playing up her eye and brow makeup. Alternately, you can color the lips with the same dark brown or black used to color her brows, calling even more attention to the fantastic color of her eyelids. Younger girls especially might go for some additional face paint added to their Cleopatra cheeks. Copy some Egyptian hieroglyphics or animal symbols such as the asp (snake), beetle or raven onto your child’s cheeks, adding even more Egyptian-inspired decoration. Dress up your daughter’s eyes even further with extra glitter and a rhinestone or two at their inner and outer edges. For girls who don’t have pierced ears, use body glitter and rhinestones to create the illusion of earrings. National Geographic: Daily News: Cleopatra’s Eye Makeup Warded Off Infections?